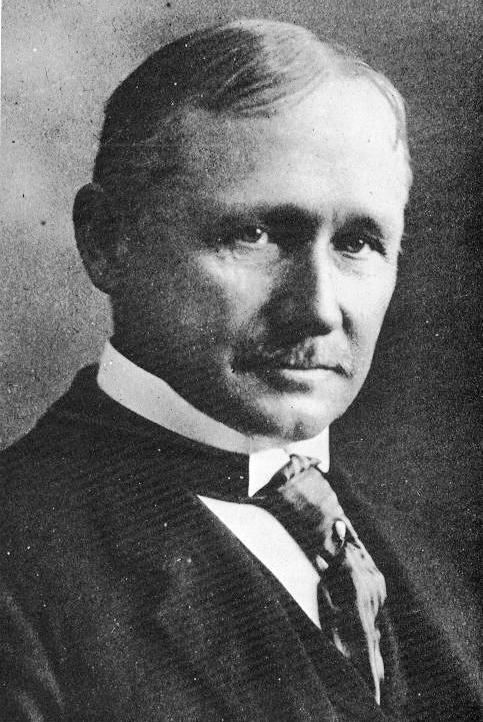 Frederick Winslow Taylor was born in 1856 in Germantown and spent most of his life in Philadelphia until his death there in 1915. After he developed his scientific management methods at numerous manufacturing plants around Philadelphia, he began to spread his techniques through a series of public and private lectures. In 1907, after serving as president of the American Society of Mechanical Engineers, Taylor began to develop and deliver a series of lectures that intricately described his scientific management theories from his Chestnut Hill home "Boxly." 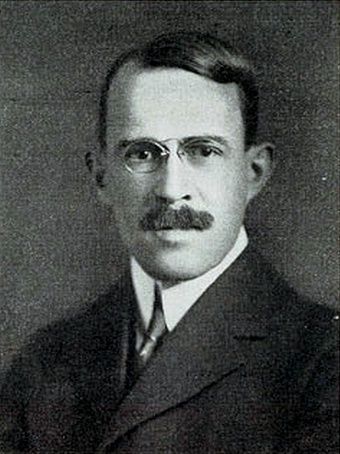 The material from the Boxly Talks was later transcribed and partially edited by Morris L. Cooke and became the foundation for Taylor's book, Principles of Scientific Management, published in 1911. Taylor's success also brought him the opportunity to teach his methods at Harvard University, where he taught an annual class from 1909 to 1914. Before Morris L Cooke met Frederick W. Taylor, he was primarily involved with the management of machines. Cooke attended Lehigh University and graduated in 1895 with a degree in mechanical engineering, then worked for years as a machinist before meeting Taylor in 1903. Cooke worked closely with Taylor, learning Taylor's methodologies of scientific management and editing Taylor's lectures for print. 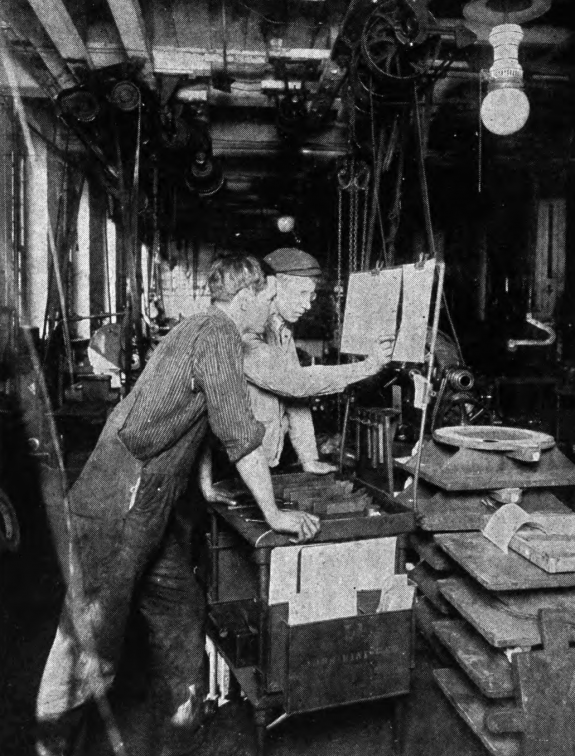 By 1905, Cooke had created his own scientific management consulting firm in Philadelphia, assisting local manufacturers in finding more productive techniques. In 1911, when Cooke became Philadelphia's director of public works, he brought the methods of scientific management to the public sector by cutting a thousand jobs and bringing in "expert" engineers to direct other workers. The Midvale Steel plant was in operation for less than fourteen years before Frederick W. Taylor began working there in 1881. Opened in 1867 as the William Butcher Steel Works, the name was changed to Midvale in 1872 when an investor in the company, William Sellers, forced William Butcher out. Midvale's plant in the Nicetown neighborhood of Philadelphia manufactured steel pieces, such as shell casings, or canisters meant for pressurization, by melting down the metal components and using either molds or machines to shape the products into their final forms. The workers in this photograph from 1887 were smelting and refining small amounts of metal in crucibles before putting them into molds. Taylor trained with steel smelters like these as he trained throughout the Midvale plant before being promoted to higher management positions and implementing more efficient working standards that removed any discretion from the workers performing the jobs. From their first strike in 1934, Campbell Soup’s production workers fought an ongoing battle with their employer, not only for better wages and working conditions, but also to protest the Bedaux system. Charles Bedaux promised companies that his program would reap the benefits of scientific management for companies that installed it, without the expense and lengthy time for implementation required by Frederick Taylor's original system. 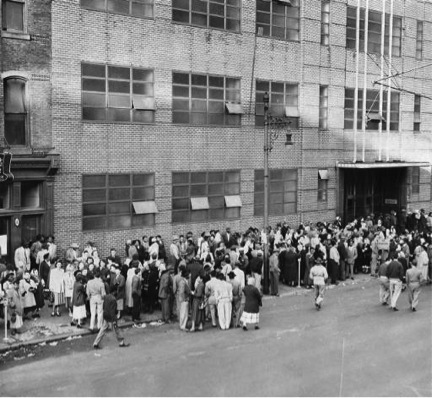 Workers at the company's original plant in Camden (pictured here during a 1952 labor protest) contended that the Bedaux system was a speedup plan cloaked in incomprehensible and pseudoscientific metrics. The “Scientific Management” movement was born in early twentieth-century Philadelphia factories but spread rapidly, transforming not only management techniques but also popular conceptions of industrialized society itself. According to its founders, the system simply sought the “one best way” to perform any task. But its time-study engineers, along with the assembly line, came to symbolize the bleak and mechanical organization of workers’ lives by industrial engineers. Its advocates, on the other hand, hailed scientific management as the basis for the transformative increases in productivity that, they argued, improved the lives of working people. 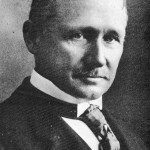 Although many early management consultants contributed to the development of the system, Philadelphia’s Frederick Winslow Taylor (1856-1915) is acknowledged as the “Father of Scientific Management”; in fact, the system is also known as “Taylorism.” His concepts and practices were embraced by industrialists and municipal reformers, attracted devoted followers and harsh critics, and inspired, if indirectly, numerous movements seeking to reorganize society by making it more efficient. The first incubators of Taylor’s experiments were Philadelphia factories, and by the mid-twentieth century his associates and imitators had installed “scientific” systems of management in all kinds of establishments throughout the region and, from there, the world. By the twenty-first century, timed-to-the-second fast-food and help-desk workers were so commonplace that most Americans did not realize how Taylorized their workplaces had become. According to its proponents, scientific management sought the “one best way” to perform any task. Applied to manufacturing, and later to other fields, it meant that “waste” of any kind, especially waste of time, must be eliminated, resulting in vastly improved productivity. Whereas earlier manufacturing relied on the expert knowledge and decision-making of craftsmen, the new approach attempted to transfer all knowledge of the manufacturing process to management—and in particular to new planning departments—which would then instruct workmen on the precise methods and motions to be used to perform each job. The system’s implementation, in companies as varied as the Link-Belt Engineering Company at Hunting Park Avenue and Twenty-First Street in Nicetown, Cramp Shipyard in Port Richmond, and Bethlehem Steel in South Bethlehem, Pennsylvania, was often beset with problems and sometimes ultimately rejected. Yet the “efficiency craze” that Taylor launched spawned numerous management consulting firms as well as do-it-yourself efforts at many companies. His arguments also convinced corporate management that it must control all aspects of how work is done if it was to survive in the cutthroat competitive world of twentieth-century capitalism. Not unexpectedly, unions like the International Association of Machinists fought these new management schemes in order to defend their members’ prerogatives and union work rules, and in other cases to oppose “speedup” or at least gain a larger share of the increased proceeds from greater productivity. Despite the global spread of scientific management, its origins and first several decades were a thoroughly Philadelphia story. Frederick Winslow Taylor was born in 1856 in Germantown to an old Quaker family. He spent his youth attending Germantown Academy, touring Europe, and engaging in cricket with friends from similarly wealthy families, though he never matriculated at Harvard as expected. 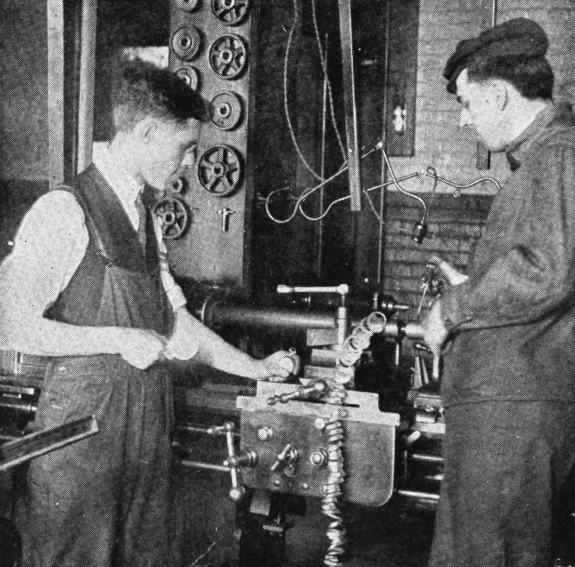 Perhaps surprisingly, he used family connections to instead begin an apprenticeship as a patternmaker and machinist at the Enterprise Hydraulic Works, a pump manufacturer at Twenty-Second and Race Streets. 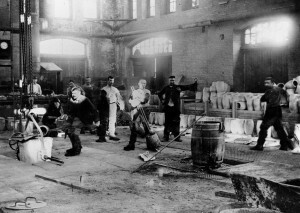 The Industrial Revolution was reshaping not only the American economy by the 1870s but also society itself, and Philadelphia was at its lead, rapidly becoming the “Workshop of the World.” It was not unusual for some young men from wealthy families to use the route of apprenticeship to gain the knowledge they needed to advance in industry. After he completed his apprenticeship at Enterprise, Taylor began working at Midvale Steel in Nicetown. Once again he tapped family connections, for Midvale was owned by the father of Taylor’s tennis partner and by Taylor’s future brother-in-law. He started at the bottom, working as a laborer for a few weeks to learn how jobs were done and to attempt to understand the motivations of workers. Taylor moved up quickly, eventually becoming chief engineer of the works, and it was in the course of his employment there that he developed the prototypes for the innovations he would become famous for. Although Taylor is most remembered for his management and organizational ideas, he also made contributions to mechanical processes and machinery, designing a giant steam hammer at Midvale, developing “high-speed steel” at Bethlehem Steel, and earning 42 patents. In fact, he first used a stopwatch to gauge the performance of machine tools, but he soon applied the same techniques to measure the motions of human workers. As Taylor formulated and refined his approach to scientific management at a succession of companies in the Philadelphia region from the late 1870s to the early 1900s, he increasingly regarded workers as elements of the production process. In his view, their actions could be precisely molded, with the right incentive schemes, by a new type of management that left no leeway for personal discretion. In Taylor’s most well known, if partially fabricated, description of his techniques, he claimed to have turned an average laborer at Bethlehem Steel he called “Schmidt” (actually named Henry Noll [1871-1925]) into a superhuman loader of pig iron (although he “firmly believe[d] that it would be possible to train an intelligent gorilla so as to become a more efficient pig-iron handler than any man can be”). Revealing his own class attitudes towards laborers, Taylor related, in his lectures and writings, what he thought of Schmidt, a “man so stupid that he was unfitted to do most kinds of laboring work,” though he built his own house, was married, and had a grade-school education. Unionists were not the only opponents of scientific management, however. Philadelphia companies like Baldwin Locomotive relied heavily on the expert skill and knowledge of their craftsmen and had no interest in Taylor’s ideas. Others, like Cramp Shipyard and Bethlehem Steel, experimented extensively with the new approach but eventually rejected it, claiming it was expensive and highly disruptive. Yet even those companies kept some parts of the system in place: Bethlehem simply renamed Taylor’s “instruction cards” to “speed cards.” Cramp’s management rejected his recommendation to “speed . . . up all of the machinery in your shops 60% beyond its present speed,” but kept his better-organized tool room. 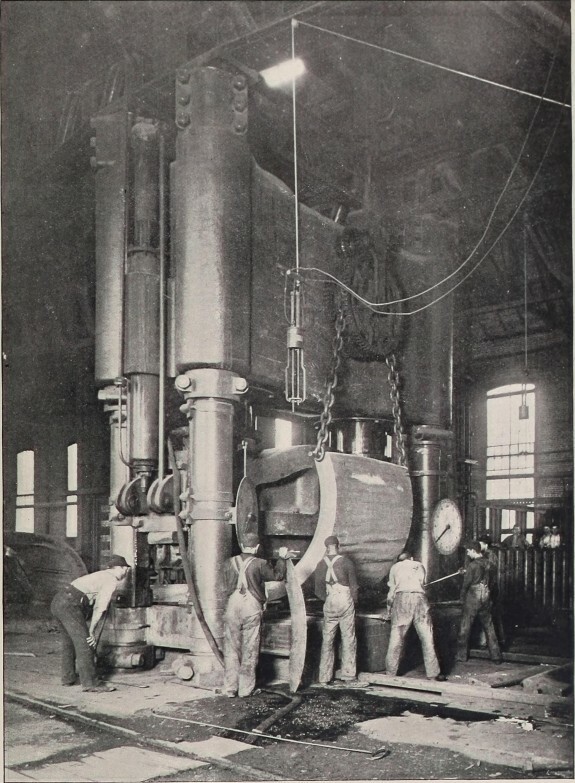 Some avid enthusiasts, like Oberlin Smith (1840-1926) of Bridgeton, New Jersey’s Ferracute Machinery Company, wanted to install the system, but Smith was “appalled” at the estimated expense to implement it in 1907, though he finally implemented a similar program some years later. Workers and socialists attacked Taylor’s version of scientific management for turning workers into automatons, deskilling craftsmen, and firing those who could not or would not perform as “first-class men.” Yet, if managers strictly followed Taylor’s prescriptions, the workers who remained did at least see pay increases, and piece rates were not reduced (at least initially). But after Taylor withdrew from active consulting in 1901, his disciples and followers, and soon other “consultants” who saw an opportunity to cash in on the latest management fad, were often less scrupulous about how the returns from increased productivity should be shared. Several of the consultants who installed Taylor’s system in Philadelphia became important in their own right and were responsible for the spread of “Taylorized” management systems far beyond the relative handful of companies that the founder implemented himself. His assistants worked on the two installations that became Taylor’s showpieces of scientific management for visitors to Philadelphia, Link-Belt and the Tabor Manufacturing Company, and implemented some elements of the system at Philadelphia’s Frankford Arsenal and the Navy Yard. The Link-Belt Company also led to the longest lasting direct Philadelphia descendant of Taylor’s original group, the Day & Zimmermann management consulting firm. Although later diversified, it was started as Dodge & Day by Link-Belt founder’s son Kern Dodge (1880-1958) and his friend Charles Day (1879-1931). After helping “modernize” Link-Belt with Taylor’s consultants, they formed their own company and began doing the same for other clients, often in consultation with Taylor, starting with the Jeanesville Iron Works in Hazleton, Pennsylvania. 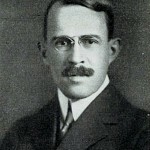 Another close confidante of Taylor’s, Morris L. Cooke (1872-1960), broadened the reach of the system to Philadelphia’s city government and marked the further integration of scientific management with the Progressive movement, when he became the city’s director of public works in 1911 and introduced several efficiency measures. Cooke wrote: “That these principles—enunciated by Taylor—can be applied to city work as they have been applied to scores of different kinds of industrial work is to me only too obvious. It opens up a field of endeavor which staggers the imagination.” He followed up by firing a thousand city employees for inefficiency, brought in two hundred “expert” engineers to direct highway workers, and claimed to have saved the city some five million dollars. His attempt to convince President Woodrow Wilson to turn Washington, D.C., into a municipal laboratory, however, failed. The “efficiency craze” spread across the country and the world after future Supreme Court justice Louis Brandeis coined the term “Scientific Management” during the famous Eastern Rate Case in 1910 and Taylor published his Principles of Scientific Management the next year. But paradoxically, the founder’s original strict interpretation of the system was diluted as more “efficiency experts” rushed to take advantage of the new opportunities. In 1911 Taylor complained that Harrington Emerson (1853-1931), a former close adherent of the Taylor method, had told Navy Yard officers that he could install all the “important” parts of Taylor’s system in a few short months. 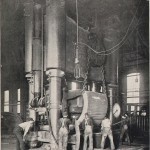 Emerson later introduced his quicker and cheaper alternative in many other plants, including Lukens Steel in Coatesville, Pennsylvania. Other companies like DuPont decided to try converting to “scientific” management methods on their own. Unfortunately, DuPont began its experiment in its Repauno High Explosives Operating Department near Gibbstown, New Jersey, in 1913. Although some employees complained that foremen were “rushing the men,” the project continued until a massive explosion killed four workers. The experiment was moved to another building. It, too, suffered an explosion soon after, killing several more men. Interest in putting an efficiency scheme into practice did not resume until the Great Depression induced the company to find new ways to reduce costs. By World War II, time-and-motion study and job standards were no longer a novelty. Young women working in the secretarial pool at the Army Ordnance offices on South Broad Street and machine tenders in steel fabrication plants had become accustomed to “efficiency experts” timing and monitoring their work. Later management trends claimed to replace Taylorism with newer approaches to work and workers, but most of them were deeply indebted to the Germantown native. The central concepts of “Lean Production,” for example, were the elimination of waste—especially waste of time—and continuous improvement, all with the goal of increasing productivity. Both original scientific management and its later incarnations also claimed to be in the best interest of workers. The central argument for the beneficial effects of Taylorism for employees rested on the premise that the proceeds from increased productivity would be shared equitably between management and labor, by the mechanism of the system’s bonus incentive plan. 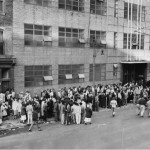 It has even been credited with raising the standard of living for Philadelphia’s working class generally. The first objection to this argument concerned all those left out of it. 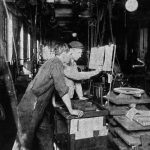 Taylor himself said there were very few “first-class men” for any job, and those who could not make the grade, whether at Bethlehem Steel or Campbell Soup, were dismissed. Those who survived the cut worked much harder than before and lost any discretion they previously had in determining how they performed their jobs, but they did see increased wages—in companies that strictly followed Taylor’s rules. The cardinal principle here was that management would not raise the amount of work needed to reach the bonus level once a job had been “scientifically” studied and rated. Very few companies kept to this precept for very long, however. At its core, Taylorism was a class philosophy, in which strict but benevolent masters would provide well for their subordinates as long as they did exactly as they were told. Far more responsible for raising Philadelphia’s workers’ standard of living were the efforts they expended themselves. In the defensive strikes of unionized craftsmen early in the twentieth century and the mass unionization drives by industrial workers during the Great Depression and World War II, workers fought for and often won a greater share of the increased productivity resulting from Taylorism and other efficiency schemes. Daniel Sidorick teaches labor history at Rutgers University New Brunswick. He is the author of Condensed Capitalism: Campbell Soup and the Pursuit of Cheap Production in the Twentieth Century. Braverman, Harry. 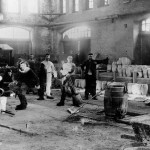 Labor and Monopoly Capital: The Degradation of Work in the Twentieth Century. New York, Monthly Review Press, 1974. Kanigel, Robert. The One Best Way: Frederick Winslow Taylor and the Enigma of Efficiency. New York: Viking, 1997. Nelson, Daniel, ed. A Mental Revolution: Scientific Management since Taylor. Columbus: Ohio State University Press, 1992. Taylor, Frederick Winslow. The Principles of Scientific Management. New York: Harper & Brothers, 1911. Wrege, Charles D. and Ronald G. Greenwood. Frederick W. Taylor, the Father of Scientific Management: Myth and Reality. Homewood, Ill.: Business One Irwin, 1991. Frederick Winslow Taylor Collection, Samuel C. Williams Library, Stevens Institute of Technology, 1 Castle Point on Hudson, Hoboken, N.J.
Henry Noll (“Schmidt”) Historical Marker. Marker Location: E. Third St. east of Fillmore Street, Bethlehem, Pa.